A responsive website to attract and recruit engineering talent. Nordstrom Rack | Hautelook is unique in the world of off-fashion retail. They carry more top-tier designer labels and brands than any of the leading retailers in their space. They're also tuned in to today’s evolving consumer, offering services such as a well-integrated multichannel shopping experience, easy returns and engaging mobile apps, while also maintaining a significant social presence. With an understanding of the evolving technical landscape, Hautelook is on a mission to create innovative software in the E-Commerce industry and continue to stand out as a leading brand. To build great technology, you need great people. 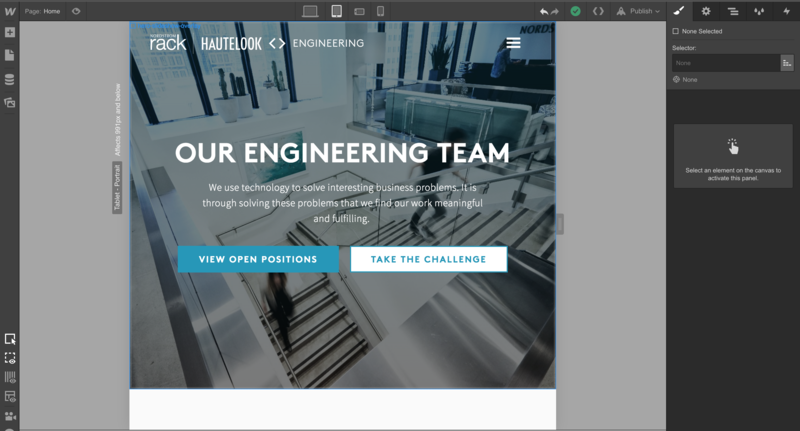 The Hautelook Engineering Team was looking to attract, acquire, and recruit new engineering talent for their ambitious engineering teams. 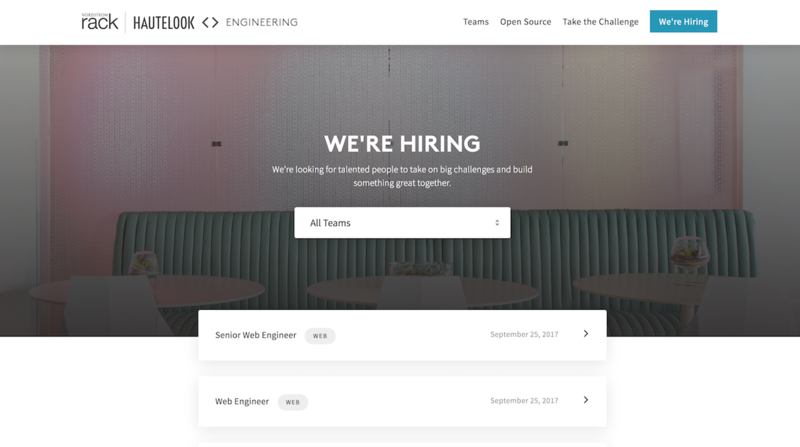 In partnership with their VP of Engineering, UX Lead, and Recruiting I helped re-design and engineer their new recruiting website from the ground up to accomplish that goal. 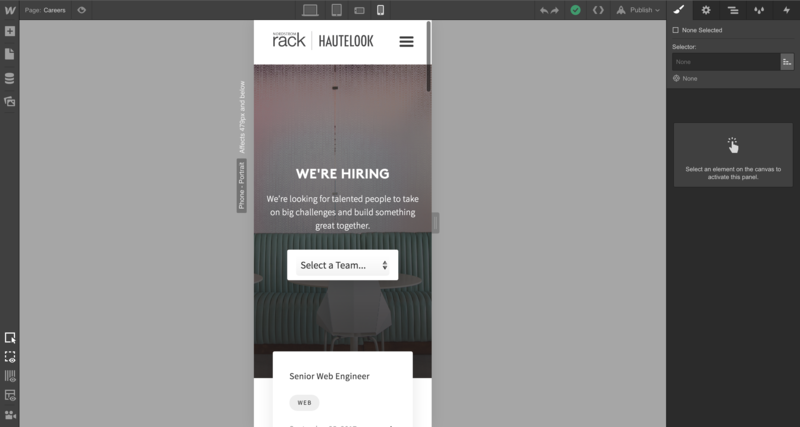 When thinking about acquiring new leads for their recruiting efforts, Hautelook was looking to answer some key questions about their new website. 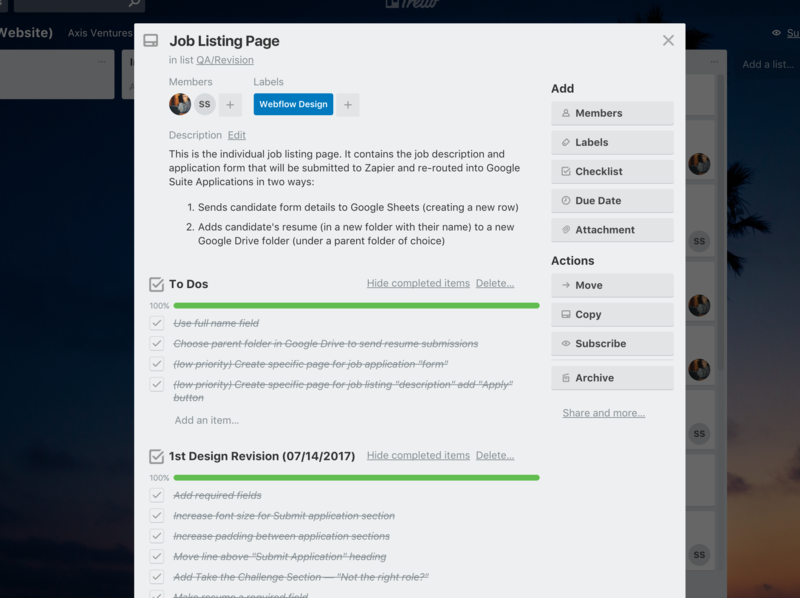 How can we organize and showcase all of our engineering teams and the open roles for each team? What can we do to attract engineers to engage with our site if they don’t want to apply directly? How can we collect, organize, and automate our data collection to streamline the applicant submissions? Before we started any work on the project, we had a kick off meeting and went through a high level product spec that outlined the vision, goals, and strategic plans for the website. The next logical step was to organize their existing content and outline a structure to achieve these goals. 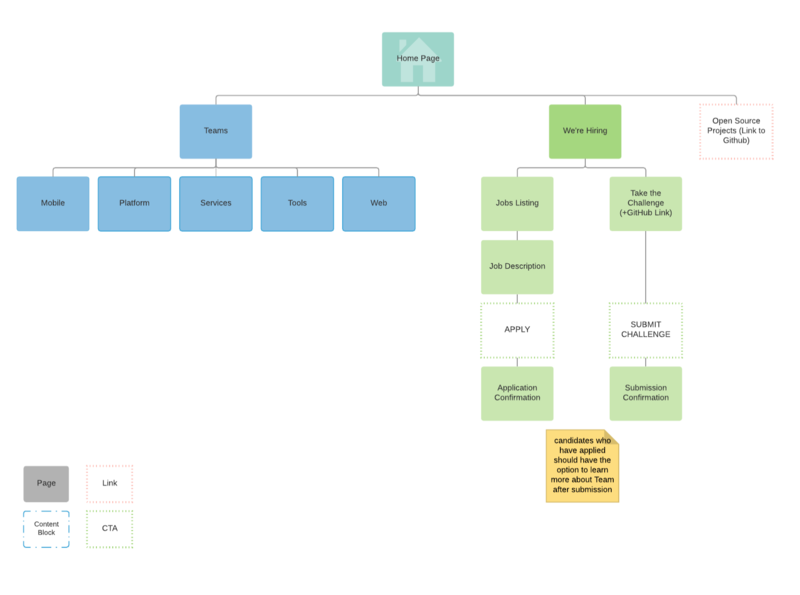 We created a sitemap to architect the site routes and user experience. Considering their team was not using a Project Management tool at this time, I recommended to set up a Trello board by which we could collaborate easily and track tickets for this project. This dramatically improved communication through later stages of the project and made changes transparent to the rest of the team. Hautelook was initially considering using WordPress to built their website, however they were also open to other platforms that might be better suited for their needs. As someone who's been working on the web for nearly 7 years, I helped educate them on how to select the right tool. A lot has changed on the web since the early days of WordPress and there are now much more streamlined platforms with great performance, usability, and functionality. Instead of spending hours in PHP and hosting on outdated architectures MySQL and Apache, I recommended a modern tool that has been truly fantastic for modern website design and engineering: Webflow. With Webflow, we could rapidly work through design iterations and cut out infrastructure engineering overhead completely. We embraced continuous deployment and shipped daily releases to a staging site for easy access and revision. One of the benefits with Webflow, is that designers can quickly create wireframes directly in the browser. There was no need to use Sketch or Photoshop, because all the controls were built into Webflow’s designer. The advantage here is that we are using real HTML elements and CSS classes under the surface which is created by Webflow - saving us potentially months of engineering time. After a set number of design revisions, the Hautelook team signed off on the wireframes and we moved into visuals. Sherlyn, UX Lead, helped provide the Nordstrom Rack Style Guide which I used to translate branding requirements into the website. Hautelook wanted to collect job applications on their career pages, however they wanted to avoid using an ATS system for their data aggregation. 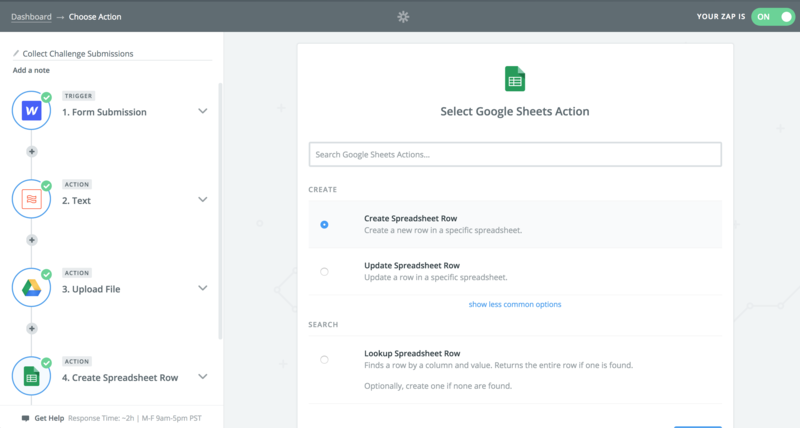 In this case, I recommended automating their data collection from Webflow forms using Zapier with Google Sheets. The problem with job applications in ATS systems is that they become a commodity and it’s difficult to accurately assess the quality of candidates. 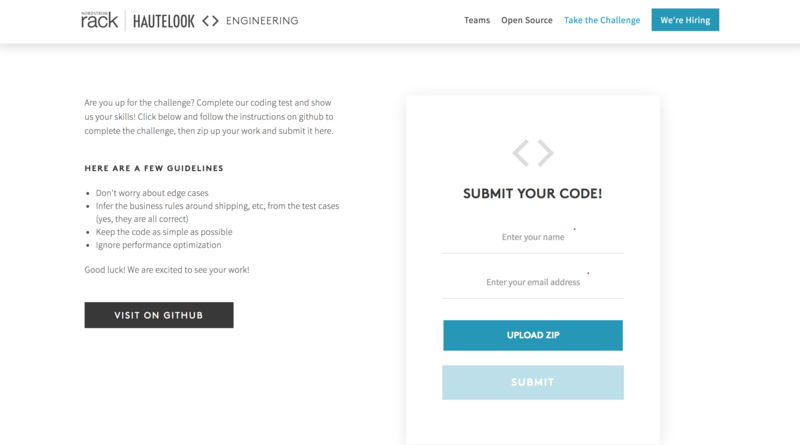 One solution to this problem was to collect code samples directly on a “Take The Challenge” page which was specifically focused around allowing website visitors to complete a coding challenge and submit their work. This allowed anyone who wasn’t necessarily interested in a role to write some code and go through assessment process without needing to apply directly. We used Uploadcare with Google Drive to organize these code samples, and created two zaps to handle the automation of this data entry. When the site was in a good place, we revisited the success metrics and I helped highlight the importance of analytics for tracking and optimization. I wanted to account for scalability and future tracking tags, so I recommended that they go with Google Tag Manager. They weren’t quite ready to take on the full-stack analytics suite with GTM, so we went with a lighter installation of Google Analytics. Because of the importance of analytics, I wrote an article on Integrating Google Tag Manager with Webflow that they could revisit in the future when they were ready. The final site is fully responsive and features a easy-to-use dropdown filter to sort positions by team. Hautelook showcases their beautiful office space through an elegant selection of high resolution photography and art direction.